Sage Dunham (NeuroTech), Alex Cerjanic (Bioimaging), and Jun Li (Autonomous Materials Systems) will present on Wednesday, December 10 at noon in Beckman room 1005 as part of the Graduate Student Seminars. Lunch will be served. Mass spectrometry imaging (MSI) is a powerful analytical technique that allows for the direct and untargeted observation of biomoleculer distributions in highly complex systems. In the work described here, we design a custom hybrid mass spectrometer capable of both matrix assisted laser desorption ionization (MALDI) and secondary ion mass spectrometry (SIMS) chemical imaging. The instrument is subsequently used for the analysis of nervous system tissues, cultured neural networks, and bacterial biofilm signaling dynamics. Owing to the high spatial resolution of the primary ion beam, biomolecule distributions are acquired for both neuronal processes and cell bodies. Important intercellular chemical messengers, such as pseudomonas quinolone signal and its precursor 2-heptyl-4-quinolone, are observed on the surfaces Pseudomonas aeruginosa bacterial biofilms. This research lays the initial groundwork for future studies into fundamental nervous system and bacterial biofilm chemical dynamics. Changes in the microvasculature of the human brain with age have been observed through post-mortem microscopic examinations of young and aged brain tissue. As the brain ages, microvessels can coil and loop, or degrade and disappear completely, changing the patterns of blood flow in the microvascular network. While changes have been reported post-mortem, the state of the microvasculature in living brain tissue in humans is extremely difficult to quantify. The intravoxel incoherent motion (IVIM) method measures blood flow in the microvasculature of the brain with magnetic resonance imaging (MRI) noninvasively. However, it is difficult to obtain reliable estimates at higher resolutions due to the inherently small signal that the IVIM method encodes in the MRI images. By incorporating a model for the noise present in magnitude MRI images through the use of a maximum penalized likelihood estimator, the reliability and resolution of the IVIM method on standard clinical MRI scanners can be improved, enabling measurement of microvascular blood flow across the brain. Molecular design of force-sensitive molecules in polymer mechanochemistry has brought new concepts in smart materials, yet its use has been limited to homogenous polymer systems. The nature of polymer mechanochemistry at interfaces, which are arguably more important considering the prevalence of composite materials in industrial applications, remains mostly unexplored. Here we report a novel system that implements mechanophores as anchor points at hetero-interfaces. Silica nanoparticles grafted with poly(methyl acrylate) (PMA) chains anchored by a maleimide-anthracene cycloadduct were synthesized to demonstrate mechanochemically-selective activation of mechanophores at heterogeneous interfaces. 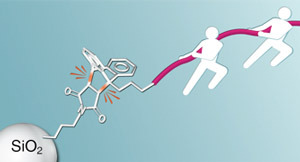 By quantifying the anthracene-containing cleaved PMA polymers, which are generated via retro [4+2] cycloaddition reactions, the first order kinetic coefficient was determined. Activation characteristics of mechanophores anchored to a nanoparticle exhibit behavior similar to mechanophore-linked polymers, e.g., threshold molecular weight and linear increase in rate coefficient with molecular weight above the threshold. This model system is thus valuable as a probe to test stress activation of interfacially-bonded mechanophores and to design smart, mechanically-sensitive and self-repairing composite materials.